I thought I would share a couple of my vintage knits. This beaded beauty has been neglected for years. It has reminded me how much I love knitting with the added texture of beads, so I am going to keep my eyes open for a new project with beaded embellishments. 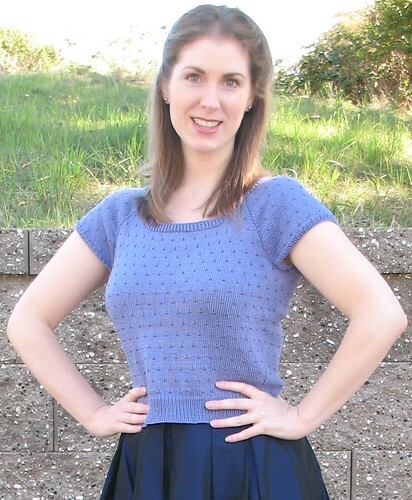 And this lace sweater was finished last weekend after spending quite a bit of time as a UFO. 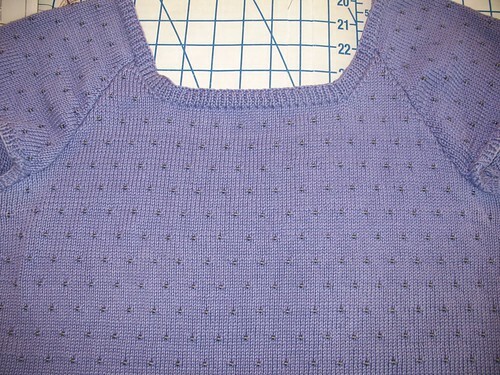 But thanks to Burda Style’s Dorset Button tutorial, I now have a finished project. More pictures may be found over on my blog, Lilacs & Lace, here and here. It is currently pouring rain outside, so I am going to pour myself some tea, and sit down with a pair of needles. Knitting is the perfect remedy for lousy weather. P.S. 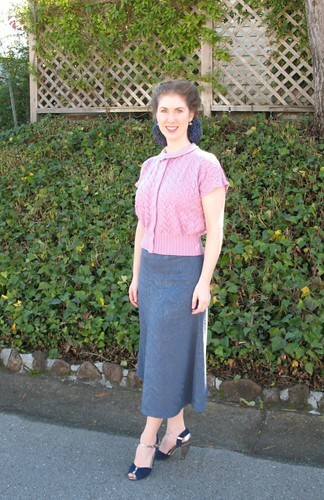 I also sewed up the skirts for both outfits, so I hope that qualifies as the “sew” in sew retro! My goodness Laura, is there anything you can’t do? 😉 Your workmanship is first rate – these are gorgeously delicate. They’re both lovely! It’s always nice to see work from fellow vintage knitters- we seem to be a bit scarce compared to sewers. And thank you for the Dorset button link- that one could turn out to be a lifesaver in more than a few projects. Oh!! I LOVE your sweater! !